In 1947, Melbourne University enrolled and competed in it's first intervarsity basketball tournament. Read more about it in the extract accessible from the 'PDF' link to the right scanned from 'The Ties that Bind' written by June E Senyard (published May 2004). "We started with nothing. We had to get acceptance from the University Sports Union and permission to represent the University. We had to find a place to practice (the army drill hall), find a competition that would accept us (Business Houses) and that was not easy. We were turned down by at least 2 other competitions. We then had to make contact with the other universities to go to Intervarsity." The club was accepted by the university with one compromise being that it be referred to as 'MUBC'. "In the university sports arena at that time, the letter 'B' stood for BOAT, as in one of the oldest sporting clubs and one of the most socially prestigious at the University. It was an expensive sport and mostly Public School. Basketball on the other hand was either a girls game or something played by flashy Yankee types in the suburbs." Editors note: during this period, the term 'basketball' with reference to women actually referred to the game we now know as netball. "One could not have people like that being pretentious and using a B when they were not in the crew. As a result we were given an extra 'k' to satisfy a few people in the Boat Club. After that 'Bk' stood for basketball." "The Boat Club thought it owned MUBC. I bought an MUBC sweat shirt and was roughed up a few times because I was not a rower (a minor issue). The Sports Union backed the Boat Club and my Blues blazer has MUBkC on the pocket. Gradually things became easier over the next few years." 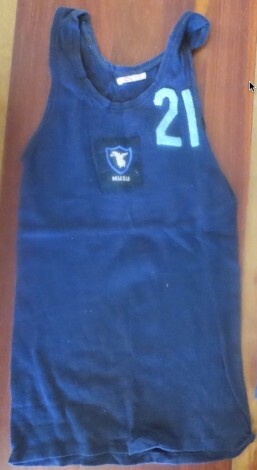 Here is the 1953 singlet - a blue workers singlet with the number and logo sewn on by family members. © Melbourne University Basketball Club 2019. This page was last updated by smoke on May 3rd, 2018.